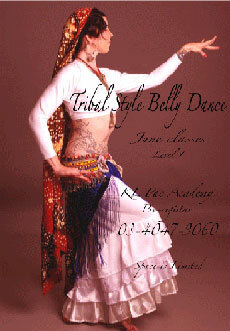 Tribal Style Belly Dance is based on traditional dance from India, North Africa and Eastern Europe. Its origins can be traced back to the 1960s in San Francisco. The dance seeks to express unity, feminine strength and build a sense of belonging. Its unique form uses dancers from all over the world. The dancers converge as one entity on the dance floor with strangers whom they have never met. Tribal Style Belly Dance unites all the dancers. Classes begin in June and comprise an 8-week semester. Nanci Traynor describes herself as an explorer of unknown realms. Nanci has always learned, practiced and taught with unconventional methods. She is influenced by artists who live by their beliefs and who do not change to fit what society wants. Nanci is also a lifestyle yoga practitioner. can please kindly advice, is it still available?